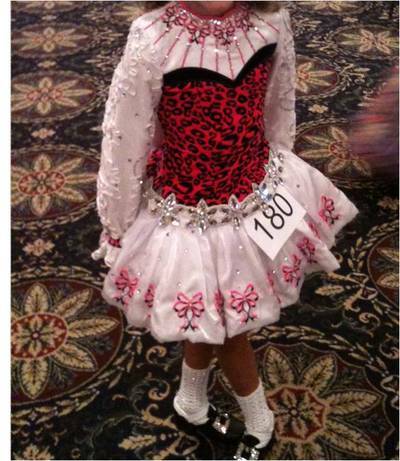 Stunning, fun Siopa Rince dress with hot pink and black animal print, encrusted with beautiful crystals. Two pieces, tutu skirt with embroidered pink and black bows, animal print and white bow attaches in the back. Drop waist with large petal crystals, dress really pops on stage. Asking Price: $US1,150 or BO. Shipping costs are included for my own country, overseas shipping is extra. Returns are negotiable.